A few years ago, marketers were decrying the death of email. Instead of fading away like Myspace and mood rings, email remains one of the most productive means of generating leads. Your email list is your most engaged audience—these are the people who have agreed to let you market to them. As such, you need to treat them like kings and queens. Much like a five-star hotel has the most comfortable rooms and a great spa, a five-star email has a special mix of the right content, killer layout and spot-on strategy. Luckily, our free eBook, “Anatomy of a Five-Star Email,” lays out 12 easy steps to creating an award-winning email marketing campaign that enables you to maximize click-through rates and conversions with every email you send. 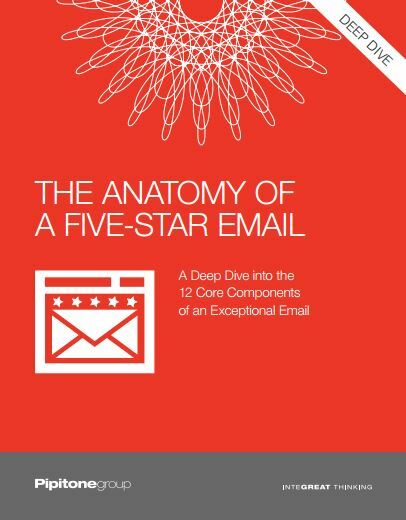 Read this free eBook to start creating five-star emails today.